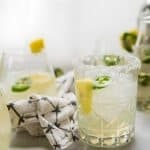 Naturally infused pineapple tequila with super easy jalapeño simple syrup and a splash of lime makes for a well balanced, dangerously delicious spicy pineapple margarita. Make the simple syrup. Combine the sugar and water in a saucepan and stir to dissolve. Add jalapeño. Over medium-high heat bring the ingredients to a boil then reduce to low. Simmer for 5 minutes and let steep as it cools. Strain the simple syrup into an airtight container and refrigerate. Make the margarita. In a cocktail shaker, combine the tequila, simple syrup, and lime. Top with ice and shake vigorously for 10 seconds. Pour into a cocktail glass. How to salt the glass. Place a small amount of simple syrup, triple sec or lime juice on a shallow plate. Dip the rim of the glass into the liquid then into either salt, sugar or any other time of dry spiced concoction. Shake off excess before turning over and then filling with spicy pineapple margarita. The heat/spicy flavor of the simple syrup can be adjusted by removing more or all of the seeds of the jalapeño before adding the pepper to the sugar-water mixture. Less seeds = less heat.